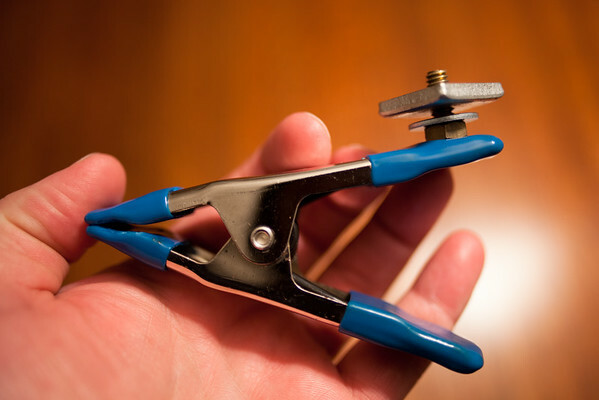 January 10, 2012 - DIY Clamp mount gadget. This is the clamp with 1/4-20 screw mount that I used on Commuting Fun shot a few days ago. It really is about as simple as it looks. One 1/4-20 pan head screw, a 1/4-20 nut to hold that onto the clamp, a washer and a square-ish flat bit of metal with a 1/4-20 tap on it. The bit of metal was a left-over from a computer rack-mount kit from several years ago. The clamp is a ~$1 item from the local big-box hardware store. I can't/won't claim to have had an original idea here - have seen lots of implementations of this on other blogs, such as Strobist.com. Taken with Canon 5dII, Zeiss 28mm f/2.0lens. ISO400, 1/30th at f/2.0. Everything was hand-held and lit with overhead incandescent lights.